Stamping with Jeannie: Another Happiness Blooms Card! I'm absolutely in love with this card!! This was a card that was shared with me at my Leadership event in Lansing Michigan last month (with Ronda Wade). I apologize that the lighting isn't better to truly show off this card. I started with a 4 1/4" x 11" Whisper White thick c/s card base, scored at 5 1/2". I then cut a layer of regular-weight Whisper White c/s at 4" x 5 1/4", embossing it with the Big Shot and the Pinewood Planks embossing folder. Attach this layer to your card base. Next, cut a 3 1/4" x 4 1/4" piece of Night of Navy c/s. Attach a 3" x 4" piece of chosen Happiness Blooms designer paper to the Night of Navy c/s, then wrap a long piece of Whisper White thick Baker's Twine around these layers 2 times. Tie in a bow and then pop up onto the card base with dimensionals. 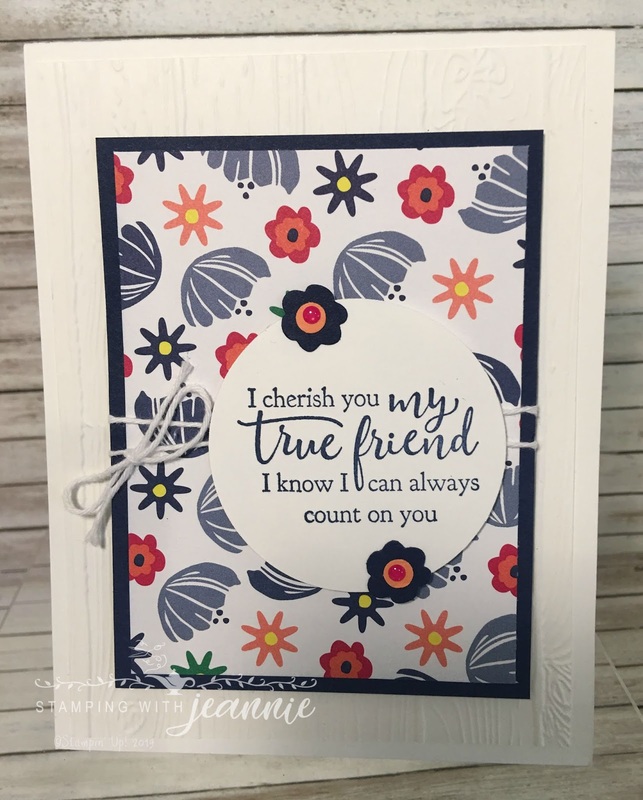 Stamp your sentiment from the Strong and Beautiful cling stamp set in Night of Navy classic ink onto a scrap of Whisper White c/s and punch out with the 2 1/4" circle punch. I popped this layer up as well. 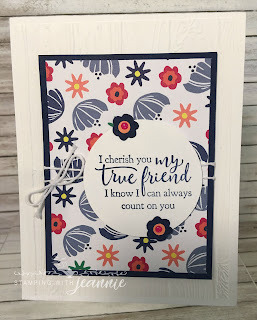 Finally, punch out 2 flowers from a scrap of Night of Navy c/s, using one of the Bitty Blooms punches from the Bitty Blooms punch pack. (You could even punch out of the Night of Navy layer above if you haven't attached the designer paper yet.) 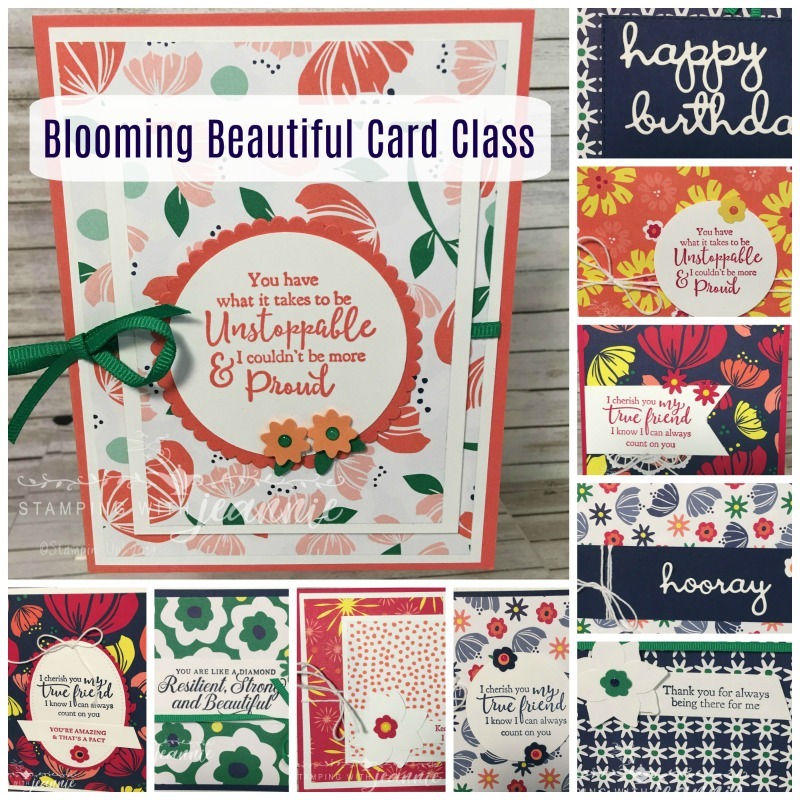 The centers of the flowers are punched with another punch from the same punch pack, from a scrap of Grapefruit Grove c/s. The final detail? A Real Red dot from the Happiness Blooms enamel dots.